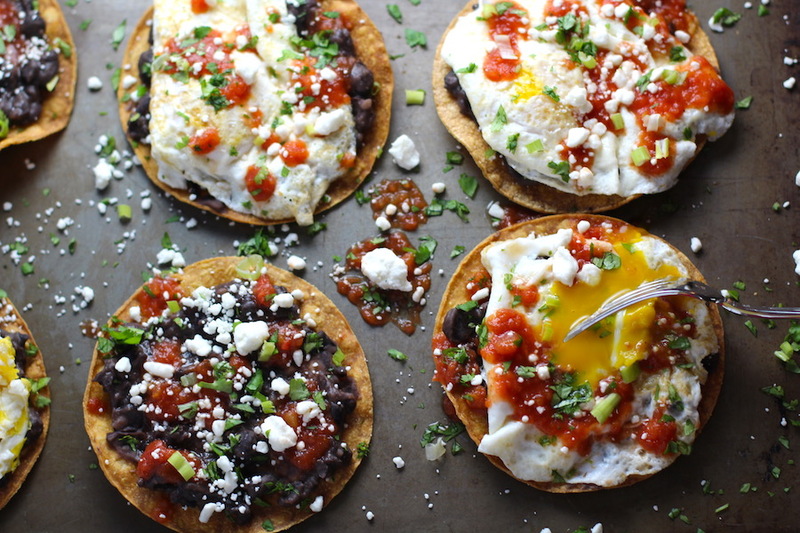 Huevos Tostadas are utterly, mouthwateringly delicious! 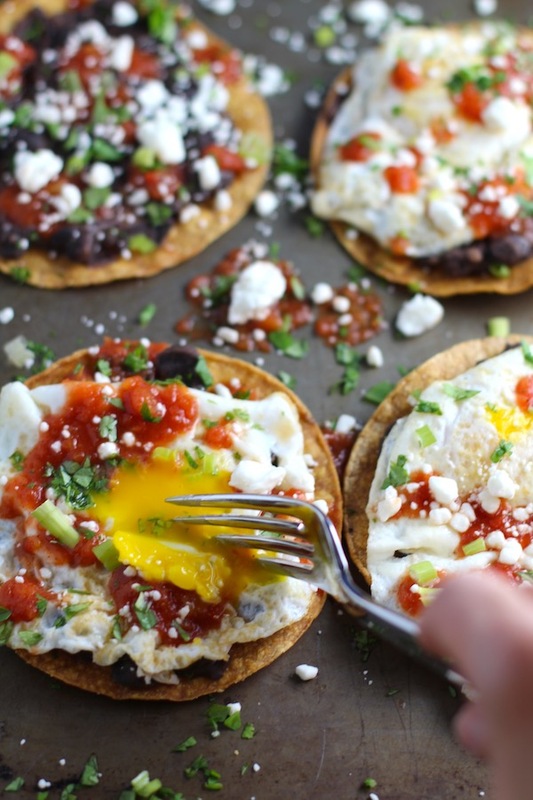 They are similar to Huevos Rancheros but are a pick-up-and-eat-with-your-hands version! 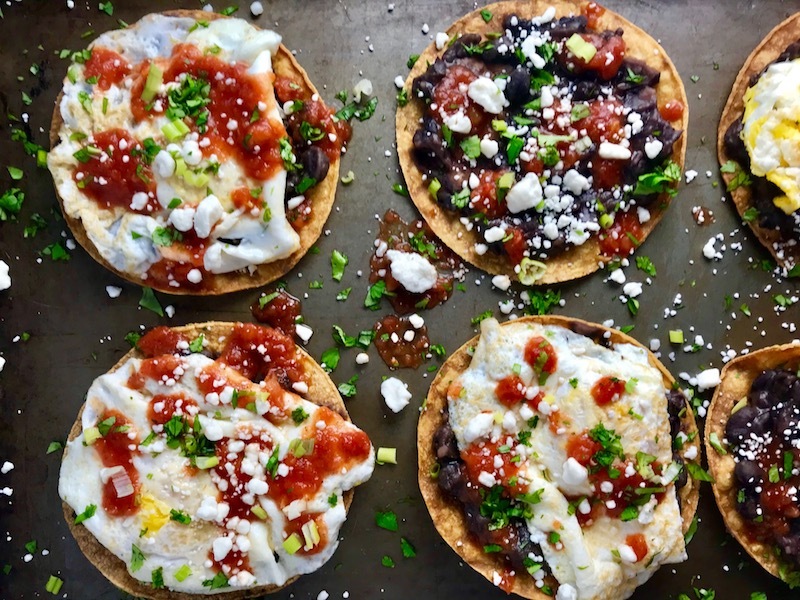 Crispy corn tortillas are topped with creamy and smoky mashed black beans, then a salty ooozy fried egg, then smoky tomato sauce, cheese, and scallions! Drooling 🤤 yet??? With just a little prep the day before, you can whip these up for breakfast or dinner in no time! And for kids, you can definitely replace the fried egg with scrambled! Black Beans are Magical! High Protein, High Fiber, and Gluten Free! Black Beans are pretty amazing in terms of health benefits. They have a whopping 15g of protein and 15g of Fiber in 1 cup! It’s recommended that Women get 25g of Fiber daily, but most women are not getting this much in their diet. When I checked my daily fiber intake, I was only at about 15g and was really surprised!! Track your Fiber for a day or two and see how you stack up. Black beans are a great source of Fiber, especially if you are eating a gluten free diet and may not be getting fiber from grains. 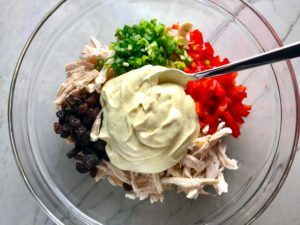 Try my Easy Brazilian Black Beans or Chickpea & Black Bean Cakes with Cucumber Yogurt Sauce or my Creamy Cajun Beans & Cauliflower over Quinoa for a few other great way to make these! The best part about these is that you can make tons right on sheet pans and let people take as many as they want. Then you can save whatever is left to warm up later. Yum and yum again! Quick note! This post contains affiliate links, which means I earn a commission (at no extra cost to you) if you purchase from them. This commission is what helps me keep this blog afloat :). But, I also share these links because I have used the products, genuinely love them, and want you to know exactly what I used. The beans are the first component that you can completely prepare ahead and then reheat. 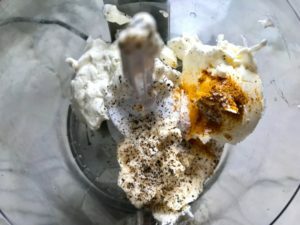 These are simply blended in a mini food processor with a garlic clove, chili powder, cumin, and water. I love mine with some texture, so I pulse until its a nice mix and there are no huge chunks of garlic. 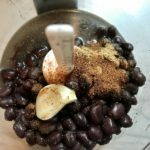 After blending, you will cook the beans on the stove for about 10-15 minutes until all of the flavors are melded together. While the beans cook, you can make the tomato sauce, thinly slice the scallions and chop the cilantro. 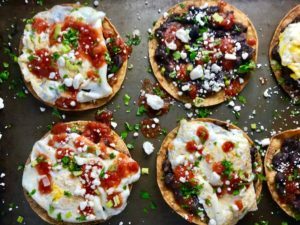 On a sheet pan or in a large bowl, place the black beans, cheese, the cilantro, tomato sauce, the uncooked tortillas, and Eggs. Store your ‘Kit’ in the fridge! When you’re ready to cook, pull your KIT out from the fridge and Preheat oven to 350 F degrees. Place the tortillas flat on a sheet pan. You will likely need 2 pans to cook the tortillas or you can do them in batches. Spray or brush the top of each tortilla with Extra Virgin Olive Oil, then sprinkle salt and Chili Powder over top. Then flip the tortillas over and do the same to the other side. Bake in oven center rack for 10 minutes one side, then flip the tortillas over and cook for another 10-15 minutes on the other side until they are crisp all the way to the center. When the tortillas are done, you can place them on paper towel or pat them down to soak up excess oil. While the tortillas are in the oven, warm the tomato sauce up in a covered saucepot on stove. Warm the beans up in microwave or on stove. Preheat a large skillet on high heat and spray with extra virgin olive oil. Then add 4 eggs at a time and sprinkle the top with salt and pepper. Cook just until the bottom sets, about 1-2 minutes, then flip over gentle and remove the skillet from the heat. For little kids you can of course swap these with scrambled eggs. Now comes the assembly. 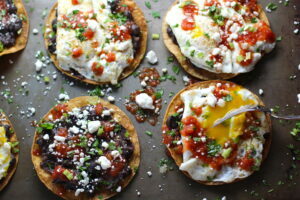 First, spread a layer of black beans on the tortillas and then top with a fried egg. Next drizzle the tomato sauce and add a sprinkle of cheese, then scallions, and cilantro. 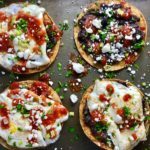 Who needs Huevos Rancheros when you can have these HUEVOS TOSTADAS! ENJOY! 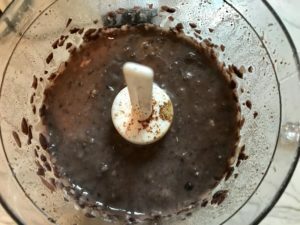 Beans: Drain and rinse the can of black beans. Add them to a food processor with with 1/4 cup water, 1 clove of garlic, and the cumin. Pulse to mince the garlic and blend up the beans. 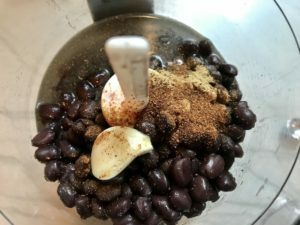 You want the beans mostly blended, but with some texture, as these will get cooked down and then spread on the tortillas. 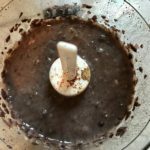 Scrape down the sides of the blender and add more water if needed, 1 tablespoon at a time, continuing to pulse until you get the ideal texture and there are no big chunks of garlic. After blending, add the beans to preheated saucepot with 1 tsp olive oil. Stir the beans around as they cook so as not to burn. Turn the heat down to med-low and cook COVERED for 10 minutes. Tomato Sauce: While the beans cook, you can mix together in a bowl, the tomato sauce, chili powder, and cumin. Taste for seasoning and add salt or adjust other seasonings as you like. Finally, thinly slice the scallions and chop the cilantro. Place these in separate storage bags. Store your 'Kit' in the fridge! 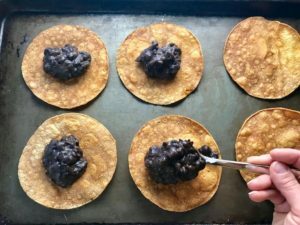 On a sheet pan or in a large bowl, place the black beans, cheese, the cilantro, tomato sauce, the uncooked tortillas, and Eggs. 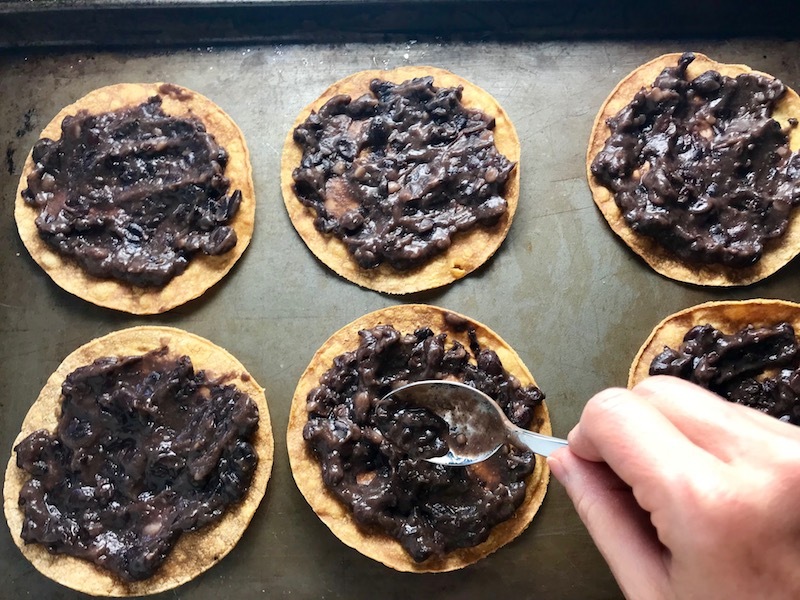 Place the tortillas flat on a sheet pan. You will likely need 2 pans to cook the tortillas or you can do them in batches. Spray the top of each tortilla with Extra Virgin Olive Oil, then sprinkle salt and Chili Powder over top. Then flip the tortillas over and do the same to the other side. Bake in oven center rack for 10 minutes one side, then flip the tortillas over and cook for another 10-15 minutes on the other side until they are crisp all the way to the center. When the tortillas are done, you can place them on paper towel or pat them down to soak up excess oil. Preheat a large skillet on high heat and spray with extra virgin olive oil. Then add 4 eggs at a time and sprinkle the top with salt and pepper. Cook just until the bottom sets, about 1-2 minutes, then flip over gentle and remove the skillet from the heat. You want the bottom to set, but not the yoke, as you want that runny. Finish for all 8 eggs. Now comes the assembly. 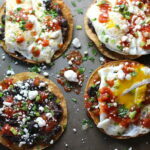 First, spread a layer of black beans on the tortillas and then top with a fried egg. Next drizzle the tomato sauce and add a sprinkle of cheese, then scallions, and cilantro. Enjoy! If you have small kids, you can certainly swap the runny fried egg with scrambled or just fully cook the yoke when frying. 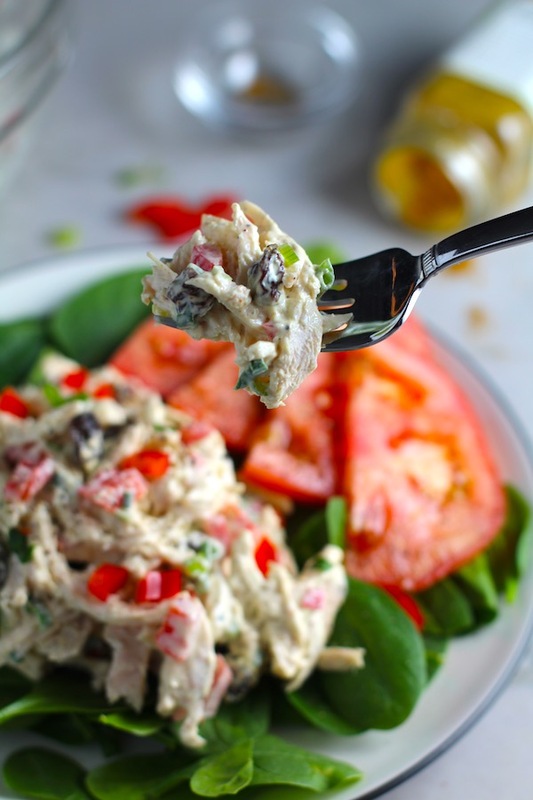 Creamy, bright, smoky, sweet, and salty…Craveable Curry Chicken Salad has it all! 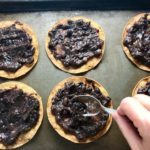 This has been one of my favorite recipes to make for over 13 years! There are so many fantastic flavors and textures. 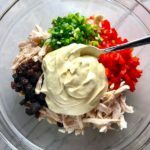 The chicken breast is simply roasted and mixed with a creamy sweet and savory curry seasoning dressing. 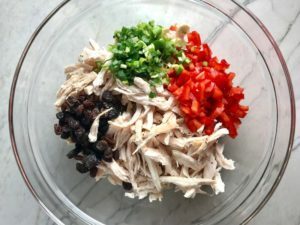 Then you get bright and fresh flavor from red pepper, a salty bite from the scallion, and burst of sweetness from the raisins. 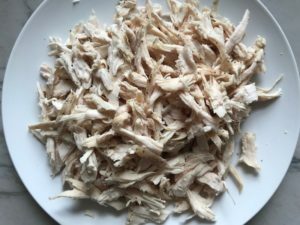 This recipe is a great for families because the curry is just enough to give wonderful flavor, but not too much to over power the chicken for the kids. Make it once and you will crave it again and again! 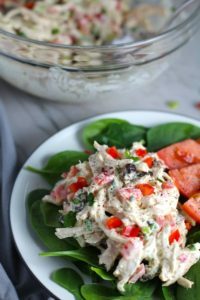 Curry Chicken Salad 5 Ways! 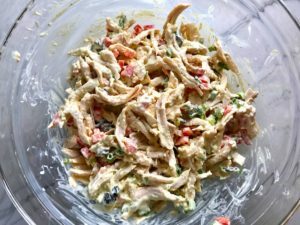 I first made this Curry Chicken Salad when I was a caterer in NYC. I made it as an appetizer and served it in hollowed out baby red potatoes. Today, I also use this recipe in several other delicious ways! Easy App! 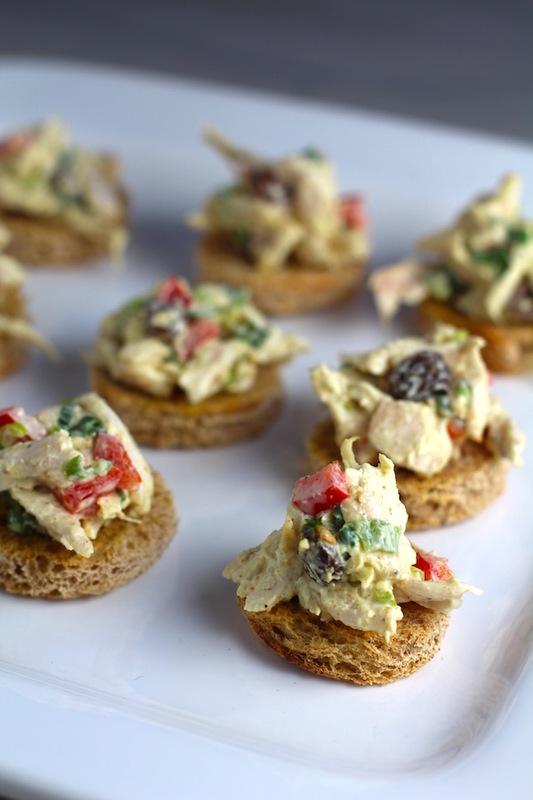 Toast Canapes – Simply cut toasts into squares or use a small round cookie cutter. Brush top and bottom with olive oil, then sprinkle with salt and pepper. Bake until toasted. 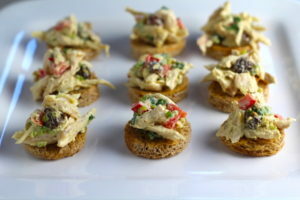 Then top with Curry Chicken Salad and serve. 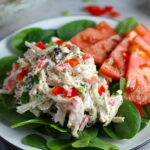 Light Salad Plate – Simply top your favorite greens with this Curry Chicken Salad and serve with tomato slices. 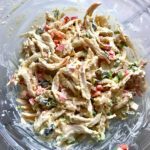 Tortilla Roll Up – This is a great way to pack it up in lunches for school! Simply layer some of the salad in a flour tortilla at one end and roll it up! Slice or leave whole so kids can hold it. 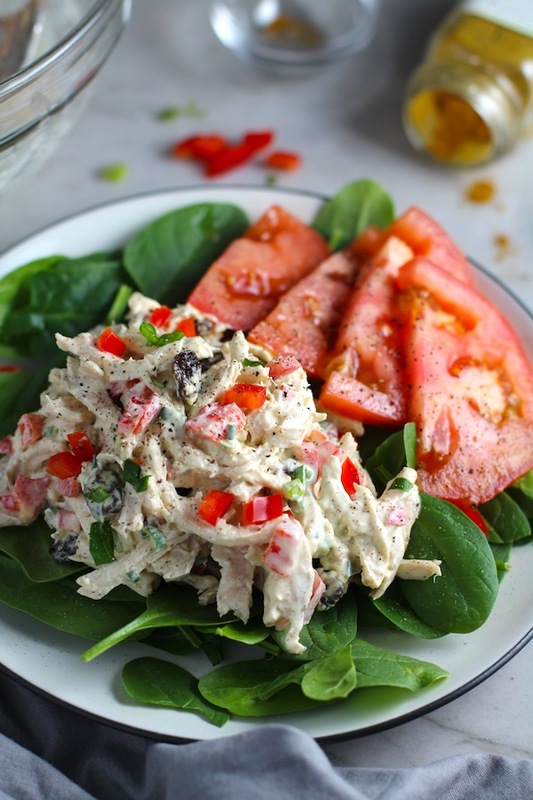 Hearty Sandwich – Toast up a crusty whole wheat bread and top with Curry Chicken Salad, Lettuce, Tomato, and even Avocado! Quinoa Dinner – Make a simple Quinoa Salad or Mushroom Quinoa Risotto and serve with Curry Chicken Salad. Ok, now that I’m drooling, let’s get into this delicious recipe! This salad can be made entirely ahead, so it’s perfect for meal prep lunches. It starts with roasting the chicken. Season the chicken with olive oil, salt, and pepper and put into 400 F degree oven for 25 minutes or until temperature reaches 165 degrees in center. 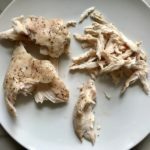 Once the chicken has cooled enough to touch, cut it or shred it with your fingers or a fork into bite size pieces. 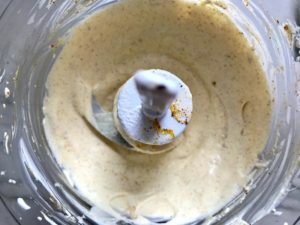 Make the Curry Dressing by adding the cream cheese, sour cream, and mayonnaise into a mini food processor. Add the Curry Powder, salt, and pepper. Pulse to blend until smooth. Scrape down the sides as needed and pulse again until all ingredients are incorporated and smooth. To a large mixing bowl, add the chicken, diced red pepper, sliced scallion, and raisins. If you think you don’t like raisins, just try them in this! They add a bit of sweetness that is unbelievable in this recipe! I went light on the scallions so not to overpower with onion for my kids, but of course you can add more if your family likes them. Transfer the Curry dressing to this bowl as well and mix to combine thoroughly with the dressing. 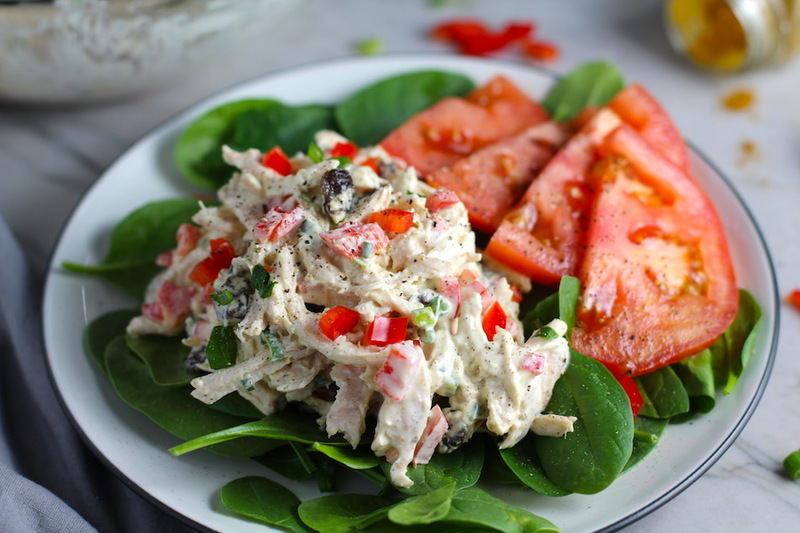 Serve as a lunch or appetizer and enjoy! Roast Chicken: Season with olive oil, salt, and pepper and put into 400 F degree oven for 25 minutes or until temperature reaches 165 degrees in center. 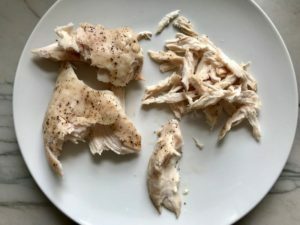 Once the chicken has cooled enough to touch, cut it or shred it with your fingers or a fork into bite size pieces. Dice Red Pepper and thin slice the scallion. 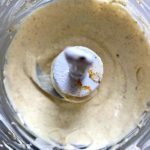 Make the Curry Dressing by adding the cream cheese, sour cream, and mayonnaise into a mini food processor. Add the Powder Curry, salt, and pepper. Pulse to blend until smooth. Scrape down the sides as needed and pulse again until all ingredients are incorporated and smooth. To a large mixing bowl, add the chicken, diced red pepper, sliced scallion, and raisins. Then transfer the Curry dressing to this bowl as well. Mix to combine thoroughly with the dressing.